The HHVT is a web-based tool that predicts the daily number of emergency department visits for heat-related illness across North Carolina. The current version of the tool inputs 5-day National Weather Service (NWS) point forecasts of daily maximum heat index and employs empirical relationships to translate these values into useful information regarding the probability of emergency department visits due to the heat. It is geared towards public health officials and emergency management personnel across the state of North Carolina. The current, updated version of the tool incorporates important feedback gained from community engagements with stakeholders. The foundation of the tool is previous research that examines vulnerability and exposure to heat-related illness in North Carolina. The findings of this work revealed a specific geography to heat-related illness, focused in rural areas of North Carolina and greatest among populations that are exposed to high heat. Heat-related illness (HRI) in North Carolina at the zip code scale from 2007 to 2012. Higher rates of heat-related illness occur in eastern North Carolina, particularly in counties in and near the Sandhills (counties include Bladen, Scotland, Robeson, Sampson). HRI incidence rates are significantly lower in and near cities (including Raleigh, Durham, Charlotte, Greensboro, Burlington) and in western North Carolina, where the mountain range results in cooler summer temperatures. Emergency Department (ED) Visits: are patient visits to an emergency department. And ED specializes in the short-term care of patients who present without a prior appointment. Note: EDs do not include urgent care facilities. Incidence Rate: are the number of new heat-related illnesses ED visits per the population at risk. Who’s at risk for heat-related illness? The most vulnerable populations to heat are those with an inability to cool down efficiently in high temperatures. These include the older persons (65 years and older) and those under the age of five years old. However, in North Carolina, the most at risk populations are those often exposed to both high temperatures and humidity. These populations are often engaged in outdoor occupations or activities, such as exercise, yard work, or occupational related tasks. The most at risk population in North Carolina is the 15 to 54 age group. Although these populations are less vulnerable to heat-related illness, they are most at risk due to their increased likelihood of engaging in outdoor activities and occupations. 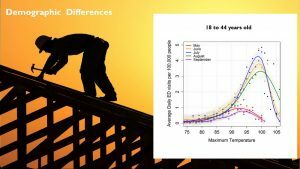 Heat-related illness occurs more frequently in males in the 15 to 54 age group range than in females of the same age range. Within this age group, heat-related illness occurs more often on the weekdays (Monday-Friday) and in the months of June, July, and August. The 15 to 17 age demographic is the most at risk of demographics under 18 years old. This population is likely to engage in organized sports. Compared to other age groups, this age group experiences higher rates of heat-related illness in August and September with the onset of high school . Although lower rates of HRI are observed in NC, this population are still vulnerable to HRI if exposed to high heat. Relative to other age demographics, this population experiences higher rates of heat-related illness in June when high summer temperatures are first observed. Isolated and rural populations are most at risk for HRI, particularly in the Coastal Plain (eastern North Carolina) and Piedmont (middle of North Carolina). These communities are removed from metropolitan locations and include only small towns. 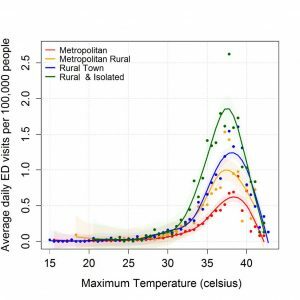 Urban populations experience the lowest heat-related illness, but are still vulnerable to high temperatures due to the urban heat island effect, which causes urban locations to be warmer than surrounding rural locations. Other risk factors increase the likelihood of heat-related illness in certain populations. Some of these risk factors include but are not limited to, living in a mobile home, engaging in labor intensive agriculture or other strenuous outdoor occupations, limited access to air conditioning, low educational attainment, and living below the poverty live. How do I understand the tool output? The HHVT is designed to provide the expected increase or decrease from the average number of emergency department visits due to heat related illness. The tool shows this as the “Departure from Average.” What does this mean, exactly? In this example, the tool tells us that the expected number of emergency department visits on the date highlighted with the red circle is 438%. This means, on this date, you can expect 4.38 times the average number of visits to the emergency department for heat related illness. For example, if you normally see 3 people in emergency department for heat illness, on this day, you can expect to see about 13 people (3 * 4.38 = 13.14). Below this figure, you will find the range. In this case, the “Range of Expected Visits” is 424% to 452%. This means that the number of visits could potentially fall anywhere within this range. Continuing with our example, this means that you can expect 12-14 visitors to the emergency department for heat related illness on this date. Models were created to predict emergency department (ED) visits for heat-related illness. These models were based on historical (i.e., retrospective) emergency department visits from 2007 to 2012 and included all visits categorized with the appropriate ICD-9 code for heat-related illness (code: 992.00). This code accounts for any illnesses caused by the effects of high temperatures (i.e., heat stroke, heat syncope, heat exhaustion, etc.). ED visits were collected within NC DETECT, a statewide surveillance system that categorizes data from ED visits by the symptoms that each patient presents with at the emergency department. These surveillance systems are important for early detection and monitoring of various health conditions that impact communities. Each ED visit was linked to the closest weather station to determine the daily maximum heat index observation. 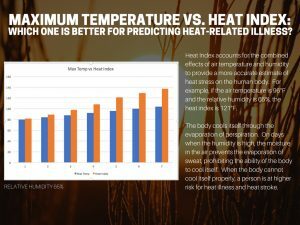 Heat Index (or apparent temperature) accounts for the combined effects of air temperature and humidity to provide a more accurate estimate of heat stress on the human body. As an example, if the air temperature is 96°F and the relative humidity is 65%, the heat index is 121°F (NOAA 2016). The total number of ED visits for heat related illness were calculated for each daily maximum heat index temperature, to determine a daily heat related illness incident rate. For instance, the number of HRI ED visits were totaled for days in which the daily maximum heat index reached 90. 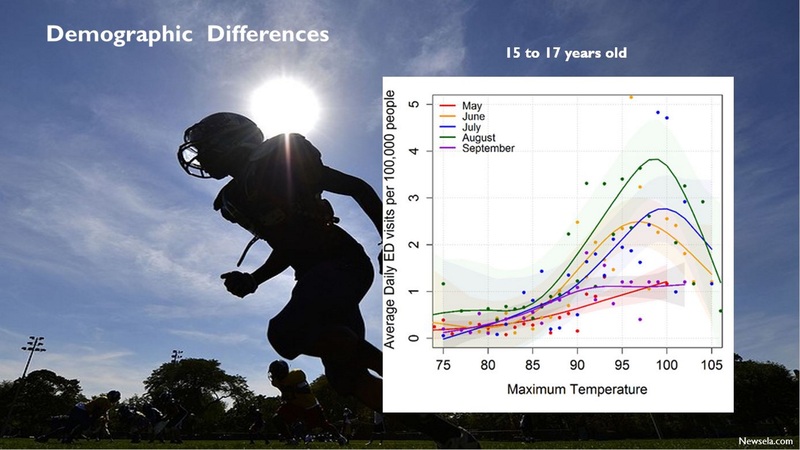 This was then used to produce a ‘daily heat related illness incidence rate for 90.’ A common modeling technique (i.e., generalized additive model) was then applied to provide an estimate of the number of heat-related ED visits can be expected at a given temperature. Heat Index accounts for the combined effects of air temperature and humidity to provide a more accurate estimate of heat stress on the human body. For example, if the air temperature is 96°F and the relative humidity is 65%, the heat index is 121°F. The body cools itself through the evaporation of perspiration. On days when the humidity is high, the moisture in the air prevents the evaporation of sweat, prohibiting the ability of the body to cool itself. When the body cannot cool itself properly, a person is at higher risk for heat illness and heat stroke. How does the tool use Heat Index? The HHVT model uses daily forecasts of the maximum heat index to predict the expected number of heat-related emergency department visits up to 5 days into the future. For each day, the forecasted heat index at 1800 UTC (1pm EST, 2pm EDT) for the following 5 days is acquired from the National Digital Forecast Database (NDFD), which is produced by the National Weather Service. For each county in North Carolina, daily heat index forecasts are provided for the location of the nearest automated weather station, which are typically found at airports. These values are used as estimates for the daily maximum heat index across the county and are incorporated into the HHVT model. There are many counties in the Carolinas that exhibit both rural and urban traits. So how should you select which category to model? The designations of rural and urban are defined by the U.S. Census. Making the distinction between rural and urban can be a complicated task. It is easy to identify densely populated downtowns as “urban” or the sparsely populated countryside as “rural”, but what about those areas in between? For the model, the urban-rural designation was based on the character of the landscape and US Census data on work-commuting flows. The consideration of work-commuting flows are essential in understanding heat-related illness (HRI) in the Carolinas given that HRI is more closely related to exposure rather than sensitivity. If a person lives in a rural area, but spends much of his or her time working in an office in an urban area, he or she is not exposed to extreme heat in the same manner in which a rural farm worker is exposed. Rural-Urban Commuting Area (RUCA) codes were used to differentiate areas according to their economic integration (i.e. commuting patterns) with urban areas or other rural areas. RUCA codes were assigned to each area based on markers of population density. 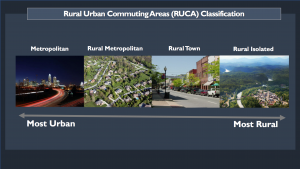 Areas were classified into one of four mutually exclusive RUCA groups: Metropolitan, Rural Metropolitan, Rural Town, and Rural Isolated. 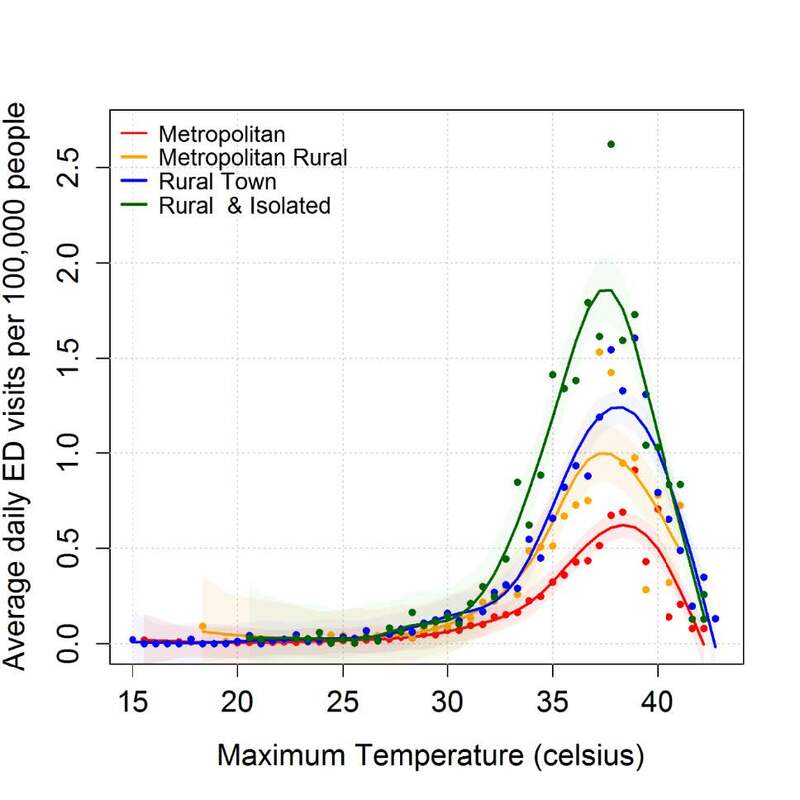 Daily HRI ED visits per 100,000 people with respect to maximum temperature for rural-urban regions. This warning system was developed to highlight differences in exposure and vulnerability across the state. Areas with higher rates of heat illness (e.g. rural areas) are warned more frequently and at higher levels (e.g. hotter colors) than areas with lower rates (e.g. urban areas). 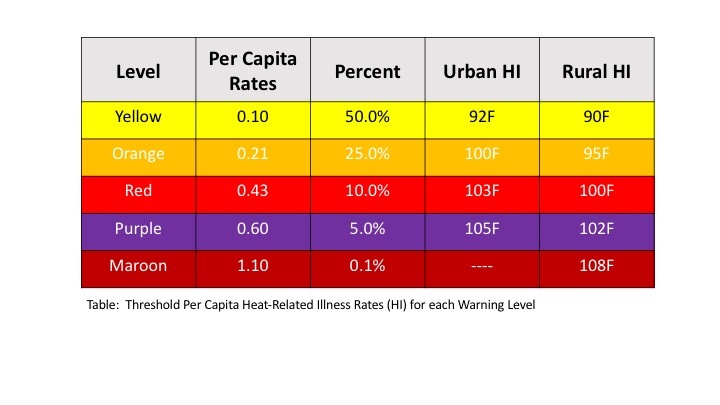 This is a “community level” model in that it warns on the basis of the predicted per capita rates of heat illness associated with the nature of the population (e.g. rural) that is present in that community. For example, the rural model for Bladen Co. predicts a rate of heat illness based on the modeling of heat illness rates for all rural areas across the eastern two-thirds of the state. Therefore it is not an “individual level” model, as it does not predict how vulnerable any one person is to the heat. An individual’s vulnerability depends upon their ability to adapt to the heat, their age, weight, health conditions, and other factors. This vulnerability would not vary if they were exposed to the same level of heat in an urban area or a rural area. There are separate models for rural and urban areas, with each predicting heat-health outcomes according to statistics gathered from their respective populations. The threshold value for each level of warning (e.g. yellow through maroon) was determined from the distribution of per capita rate of emergency room visits for the population of the eastern two-thirds of the state – the coastal Plain and Piedmont. The yellow level is given when any model (e.g. rural, urban etc.) predicts between 0.10 and .21 visits per capita. The per capita rate of 0.10 corresponds with the 50th percentile. Across the eastern two-thirds of the state, 50% of the days between May 1 and September 30th will show per capita rates of heat illness that exceed 0.10. In the urban and rural models, this corresponds with a daily maximum heat index of 92 and 90F, respectively. Because the population in urban areas is less exposed to the heat, the 0.10 threshold value is not reached on as many days. Consequently, a higher heat index (92F) is required for this threshold to be reached relative to the rural area (90F). The orange level is given when any model (e.g. 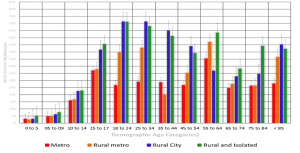 rural, urban etc) predicts between 0.21 and .43 visits per capita. The per capita rate of 0.21 corresponds with the 25th percentile. Across the eastern two-thirds of the state, 25% of the days between May 1 and September 30th will show per capita rates of heat illness that exceed 0.21. In the urban and rural models, this corresponds with a daily maximum heat index of 100 and 95F, respectively. The red level is given when any model (e.g. 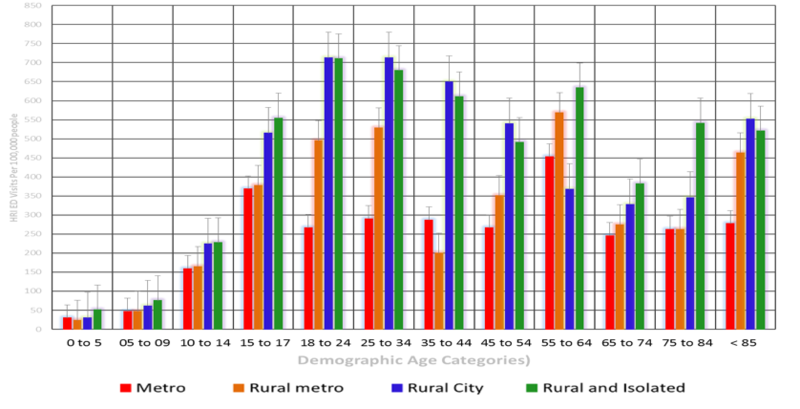 rural, urban etc) predicts between 0.43 and .60 visits per capita. The per capita rate of 0.43 corresponds with the 10th percentile. Across the eastern two-thirds of the state, 10% of the days between May 1 and September 30th will show per capita rates of heat illness that exceed 0.43. In the urban and rural models, this corresponds with a daily maximum heat index of 103 and 100F, respectively. The purple level is given when any model (e.g. rural, urban etc) predicts between 0.60 and 1.10 visits per capita. The per capita rate of 0.60 corresponds with the 5th percentile. Across the eastern two-thirds of the state, 5% of the days between May 1 and September 30th will show per capita rates of heat illness that exceed 0.60. In the urban and rural models, this corresponds with a daily maximum heat index of 105 and 102F, respectively. The maroon level is given when any model (e.g. rural, urban etc) predicts greater than 1.10 visits per capita. The per capita rate of 1.10 corresponds with the 1/10th percentile. Across the eastern two-thirds of the state, 0.1% of the days between May 1 and September 30th will show per capita rates of heat illness that exceed 1.10. In the urban and rural models, this corresponds with a daily maximum heat index that exceeds 105 and 108F, respectively. Select an infographic for a downloadable version. Want to add your organization’s information to the infographic? Click here for a Power Point version to download.